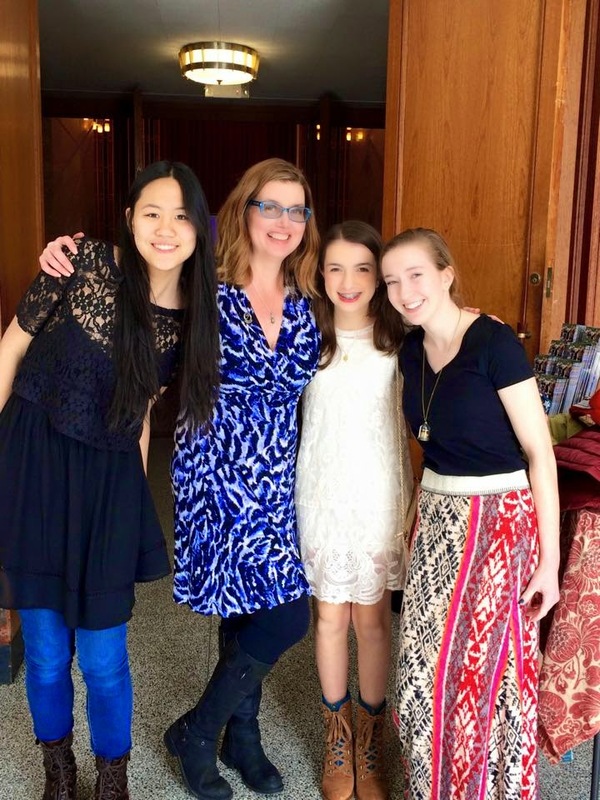 Léna Roy: Ode to a Ceremony: The Scholastic Writing Awards! Ode to a Ceremony: The Scholastic Writing Awards! Yesterday marked the third annual Hudson-to-Housatonic Scholastic Writing Awards at Manhattanville College. My husband Rob and I took this on as part of our work with Writopia Lab and to enact Writopia's mission of spreading joy, literacy and critical thinking through creative writing to all kids and teens. Writopia Lab became an affiliate for the Scholastic Art and Writing Awards to ensure that teens in our area would be celebrated with due aplomb. And yesterday they were. They came from throughout the lower Hudson Valley NY, up into the Litchfield Hills, and over to New Haven CT. It was all due to the risks they'd taken as poets, essayists, and storytellers, and because their parents and teachers supported them and created safe spaces where these young writers could express themselves. 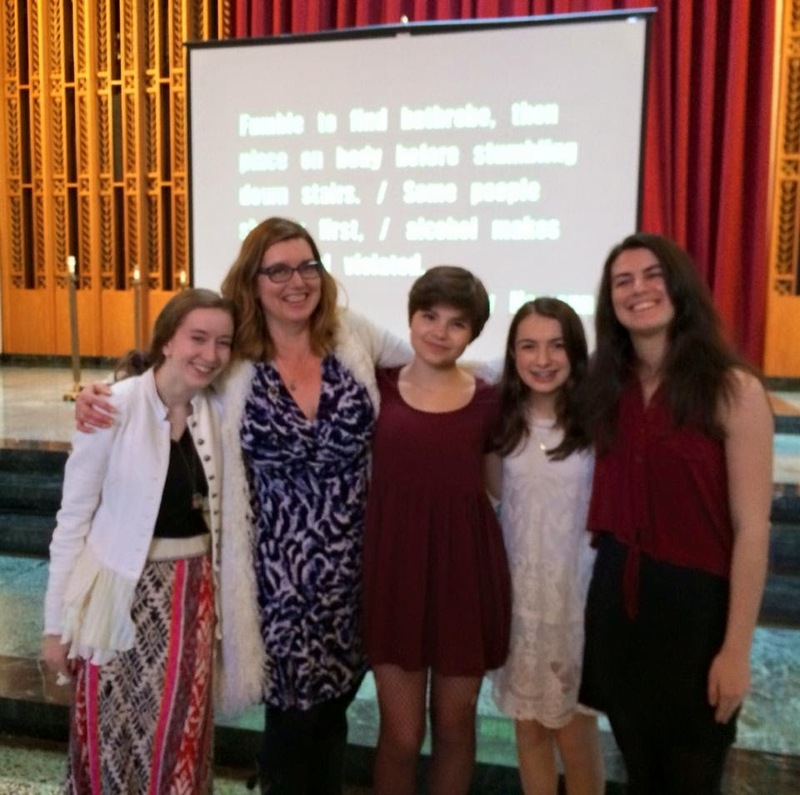 Here I am with three of my students and Gold Key winners: Elizabeth, Kaley, and Julia. And here again with Julia, Isabelle, Kaley and Caroline! I was thrilled by the outpouring of community support - not only did we have other Writopia staff on hand to help run the show, but we also had parents and students lend a hand. We had over 150 students come to the ceremony, and nearly 600 people filled the chapel next to Reid Castle at Manhattanville College, helping us acknowledge these extraordinary teens. Gail Carson Levine (Ella Enchanted) was our keynote speaker, and she captivated everyone with her no-nonsense writerly advice: to cultivate patience (writing can be hard and SLOW), to be free to fail, and to ignore global criticism but to create a community where you can be critiqued fairly. The most moving part of the ceremony was the kids themselves. We had them each take the stage and announce their names and what they have been recognized for, and many also declared aloud to the audience why they write. They told us they write to connect with others, they write to know what they are thinking, they write to be masters of their own universes, they write to express their emotions, they write because if they didn't - they would go mad. They told us they write because it's the only thing that's permanent, that they can make up their own rules, that they can express themselves in ways they can't in real life, in ways that would otherwise be impossible. They write because life is finite and the works they create are infinite. They write not to talk and still be heard, to explore their fantasies of who they want to be, for space to think, to learn more about themselves, because its NOT math! They write to create their own truth, to open up new opportunities and because it's the one thing they do for themselves and no one else. And as Rebecca Wallace-Segall (Executive Director of Writopia Lab) pointed out at the end of the ceremony, not one of them said that they wrote to win an award. Sounds like a magical day! Glorious memory for all involved, even those of us who experienced solely through your blog. Thank you for igniting young imaginations and talent. We WALK around and find the kisses. We say the number and color the number on our chart! Here's my tip: don't hide them too hard...you end up missing a few...and that means they hang out in your room for eternity. It is good to hear about Writopia's mission of spreading joy, literacy and critical thinking through creative writing. As a creative writer, I am also trying to make my customers happy by delivering good quality articles. Join in thesis writing service and make your life happy. Thank you for sharing the post! I really like your style of writing! i need to utilize this chance to state that I truly adore this blog.It is a stunning asset of data for my working. Much obliged to you to such an extent. nice post with useful information..